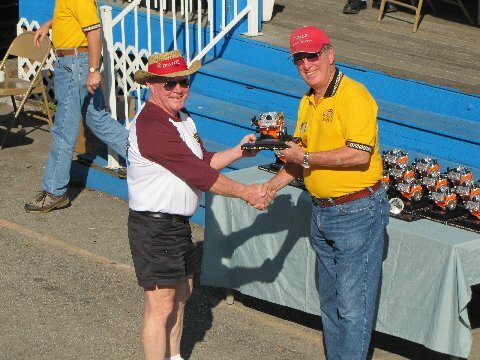 John accepts another 1st Place Trophy at Wonderful World of Corvettes - 2013 in Kissimmee. The trophy cabinet is filling up fast. "This image was provided by Joe Symmes. He and Jewel are members of the club that does that show each year. Barbara and I attended The Wonderful World of Corvettes in Kissimmee on January 26. In attendance from CCO, Ed and Sandra Merchut, and Steve Jones. This year there were 12 great looking C1s in the show... [when awards were announced] ...they called out the 3rd place first and it was a great looking C1. Then they called out 2nd place [which was] an even better looking Corvette. And then the big surprise, they called [us] for 1st place. WOW! I was shocked. The trophy is a fuel injected 327 [model] from the C1 era..."